...... oavsett om det handlar om pop, visa eller drar mot jazzen så lämnar Stories Of New Mornings stort avtryck och hennes röst är precis som tidigare bland det allra mest behagliga som finns att lyssna till. 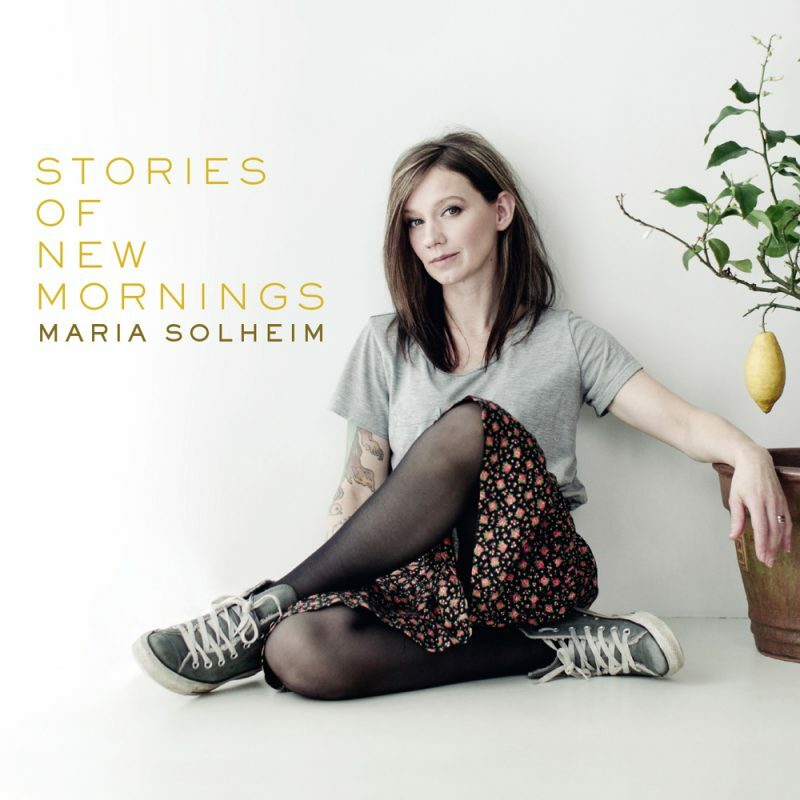 The songs on Maria Solheim's sixth studio album “Stories of new mornings” can be considered variations on Alf Prøysen's song “Du ska få en dag i mårå” [Tomorrow is a new day]. The theme is about still being alive. Waking up and knowing that you can make choices. That life has more opportunities to offer. Every Christmas I wish for a new copy book and a black felt-tip pen. I’ve had this wish since I was a teenager. It’s the best gift I can get. There is just so much potential in a felt-tip pen and some blank sheets of paper. In my music I’m open about everything, and yet everything is still covered by a veil of music and lyrics. Some of the songs are stories that only I know. Feelings I had almost forgotten. Others are spontaneous thoughts or melancholic musings about time and its limitations. I photograph the moods with my guitar, my melodies and my lyrics. I wish I were in a band. That’s my earliest dream. The dream which is one of the strongest building blocks in my life so far. The dream of playing in a band which came to fulfilment. After my fourth album I was tired, and when the dream no longer was a dream it fell apart. I put my guitar away. And I thought I might never touch it again. So I took tests. Job tests on the web. There must be something else I could dream about? The internet gave me no answers. After many years away from music new songs began to pop up in my mind. And with the songs the dream came back. Perhaps stronger than before. This dream has given life to this album. Maria Solheim continues to move on the fringe of the pop genre. She has often been placed in the Indie pop category, having repeatedly challenged the conventional wisdom for making a pop song. On the album Stories of New Mornings you find both: Good pop music, spiced with special musical elements here and there that underline and reinforce the message in the music. Maria is supported by a powerful team of musicians on the album, where she and the musical arranger, Christer Slaaen, have created an album which ranges from catchy pop tunes, to tender violin sections, pleasing lyrics, surprising Latin American rhythms, fuzzy guitars and the sound of rain. If you listen very carefully, you may also hear the sound of a black magpie on one of the tracks. Maria Solheim has a long career behind her. Leaving a small fishing village in Nordland county at the age of 18 to release her first album, she was only twenty when she travelled alone to Tokyo to launch her second album to an Asian audience. When 22, she released her third album, and was asked to sing in the Norwegian Royal Castle at the baptism ceremony for Ingrid Alexandra, princess of Norway. With several nominations for the Norwegian Spellemann Music Award, she has constantly toured Norway and abroad. Maria Solheim has had several collaboration projects. In 2009 she wrote the song “Rom for alle” [Room for all] which topped the VG [largest national newspaper] charts for several weeks. This song was a duet with Hans Erik Dyvik-Husby, then the singer in the band Turboneger. Contributors: Christer Slaaen: guitars and producer; Thomas Gallatin: drums; Tor Egil Kreken: bass, banjo; Mari Kreken: backup vocals; Tarjei Nysted: violin; Stephan Slaaen: saxophone; Erlend Barrat-Due: clarinet. Heart Heart is a song reflecting this self-searching. Through the music and lyrics, I feel that I come into contact with the person I was when I was a child. The person I was when I was an adolescent. The person I am now. The voice in my head is the same. It’s a comforting voice. In my music I am able to tell myself that everything will be all right. And I believe in it. All the songs come from the same strange doorway into my subconscious. I crawl into the dusty parts my brain. I try to catch the past and the present in the same three, four, five minutes. The River – Personally I shy away from conflicts, at times I’m terrified in social settings. In my music I find room to express all these difficult feelings and the fine and easy and hard. The musicians and the producer colour the songs so they reach out to everyone. It’s not just my life. It takes on colours from their lives too. The River is one of the first songs I wrote for this record. It’s like an ode to the Drammen Fjord. This fjord is my Jordan. And this might mean that for me Røyken, the district across the fjord, is heaven. I’m still not sure about that yet. The River was written after I moved to a new place: Svelvik. This little rural community was then changing drastically. Schools were being shut down, day-care centres the same. There was an angry mood in the air. I had joined a sewing club. We had had our first real misunderstanding. We had cried together for the first time. Walking home from the sewing club I thought about how incredibly terrifying it is to be fond of or love somebody. Putting oneself in a situation where you could get hurt. To become engaged in your local community. Moving to a small community. And while I was walking home I looked at the fjord, which the Drammen river flows into. It was flowing past me. And there and then “The River” was born. I sang all the way home, throwing my worries at the water that was flowing and flowing and flowing. Mornings with you is a song I wrote for my husband when we had been married for ten years. It’s a follow-up of some kind to the song “You – every morning” which I wrote in 2006. Then my husband and I had just been engaged. Trygve Skaug was my accountant in 2011. I just recently found this out. I knew we had a connection, but was unable to add two and two. Fortunately, he did, at least at that time. But he stopped being an accountant in 2012. And in 2017 he was nominated for the Spellemann music award. We had worked together once before. On his record. I wrote the tunes and he wrote the lyrics. It was great fun. I knew already then that I wanted to invite him to do a song with me. I like Trygve, and was very pleased when he wanted to join me on this duet. Summer came with you is a song written for my youngest daughter. Her arrival was so very unexpected. Sometimes life really surprises you. When she was born I had an explosion of songs in my head, and it was as if she shook loose many thoughts and songs that had been stuck somewhere. My children represent pure happiness for me. And at the same time also an overwhelming anxiety about death. I am incredibly grateful to have had the chance to be a mother and my family gives me a sense of belonging I missed when I was younger. I’m less restless. But I still carry a yearning in me. A longing to be allowed to grow even a little bit more. Perhaps understand a little bit more. See more bright mornings.